EUNICE MARIE JACKSON, 96, passed away peacefully, May 28, 2017, at West Meade Place, surrounded by her family. She was a resident of Nashville, and a homemaker. She was preceded in death by: her husbands: Elgie Edwards, James O. Smith, and John Jackson, and a son, Randell Edwards. She is survived by her daughters: Patricia Marlin (Wayne), Sharon S. McKinley, Grandsons: Brian Marlin, Jason Marlin, Billy McKinley, Jimmy McKinley, and Todd Edwards. Great-Granddaughters: Olivia Marlin, Ava Marlin, and Katherine McKinley. Great-Grandsons: William McKinley, Maverick Marlin, and Stetson Marlin. Eunice’s visitation will be held on Friday, June 2, 2017 from 11:00 a.m. to 1:30 p.m. Her funeral service will be at 1:30 p.m. at West Harpeth Funeral Home. Interment will be at Woodlawn Memorial Park. I knew Eunice when she was married to John Jackson . They came to my Easter Dinner once . My Daughters & I went to their house for ice cream . We loved them both dearly . We also attended James Avenue Church of Christ with them . 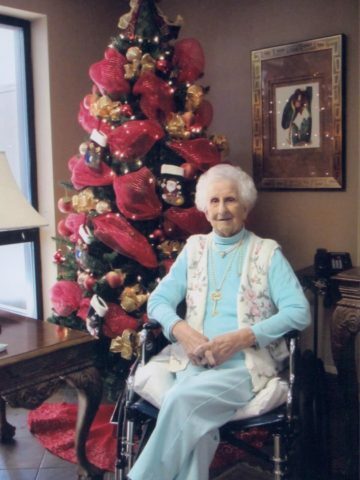 Eunice was a sweet strong lady . May she rest in Peace .